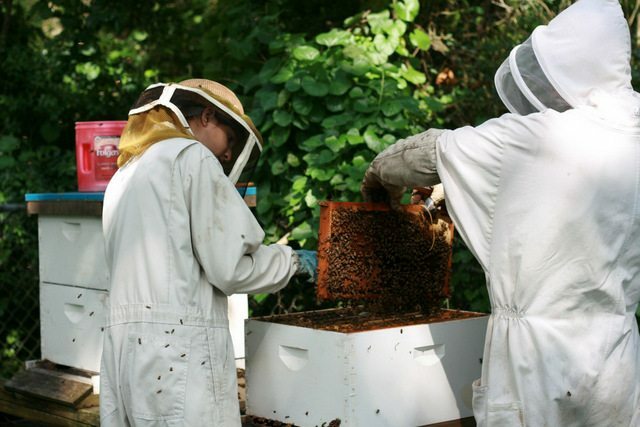 On Monday, Gabriel woke up and said, “Today is the day to check the bee hives.” We’ve had so much rain that there really hasn’t been a good time to get into the hives to check them. So, I did what any good mom would do, I put on a long sleeve shirt, long pants and a veil and grabbed my camera to take pictures. Phoebe had a friend visiting and I encouraged her to but on a bee suit and be Gabriel’s assistant. Gabriel first harvested from the top bar hive. A good friend made this hive for Gabriel when he first started beekeeping. It’s a wonderful hive. 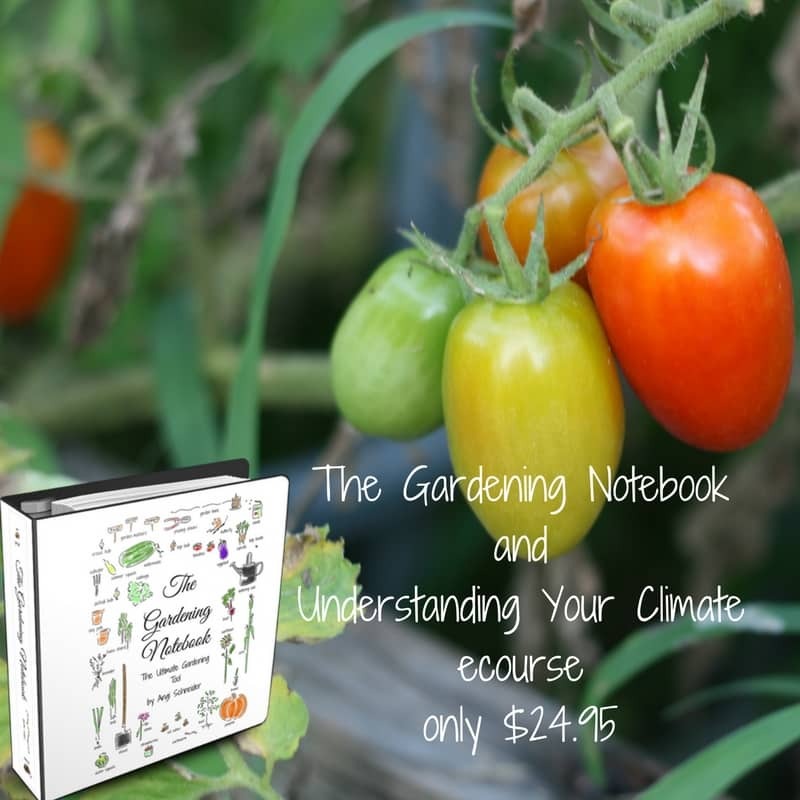 You can’t expand it so you have to harvest more often to give the bees room to grow. Gabriel leaves a good two inches of comb on the bar for the bees to attach the new comb to. The dark part is old comb. If you look, you can see the bees coming home full of pollen on their legs. That is what the orange stuff is on the bee to the far right. The Langsthroth hives are different in that you can expand them but putting supers on them. Gabriel likes to keep his hives smaller so he doesn’t do a lot of expanding. I’m not sure exactly why but I think because we’ve had such a hard time with the drought – although that cycle seems to have broken. He moved some frames from two supers to harvest. 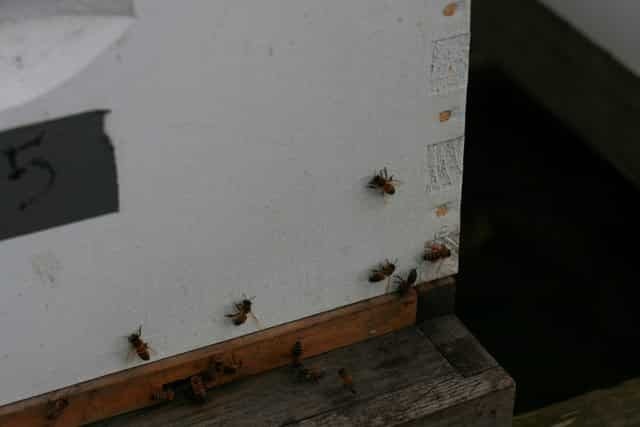 While he had them open he removed the burr comb which is just comb that the bees are building outside of the frames. It’s really pretty and white, I will probably buy it from him to use in lip balms. He also gave our friend a bee lesson pointing out where they store pollen, the difference between drones and workers and what the different cells look like. Homeschooling at it’s best. Gabriel moved the supers out of the beeyard and to our picnic table where he inspected each frame to see if it was full enough to harvest. Then he brought those frames inside to harvest. For the top bar comb, he cuts it up and bags it. Carl takes it to work and his co-workers buy it. Since we only have a two frame extractor the langsthroth frames took a while – like all day. But Gabriel enjoys the work and even though many of us offered our assistance in uncapping the comb, he declined the help. 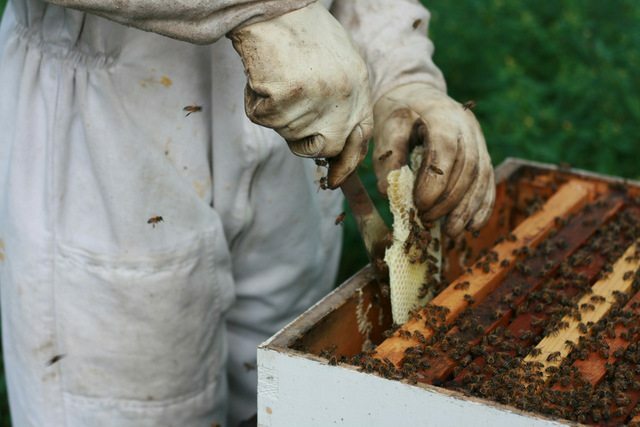 If you are just starting with beekeeping or wanting to learn more, you will want to read this article about common mistakes to avoid. Our other bee updates are here. If you are looking for beeswax we have some for sale in our Etsy shop. How are the bees in your neck of the woods? I’m glad you enjoyed seeing it. 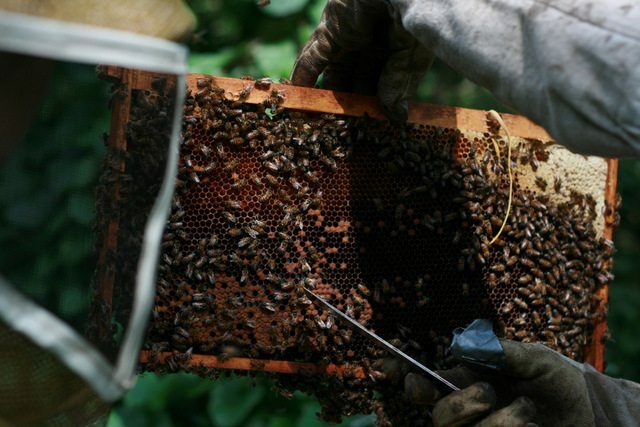 Maybe you can find a local beekeeper to buy your honey from. Try calling your county extention agent (most US counties have one). We used to keep bees. The only time I ever got stung was when I was pregnant. 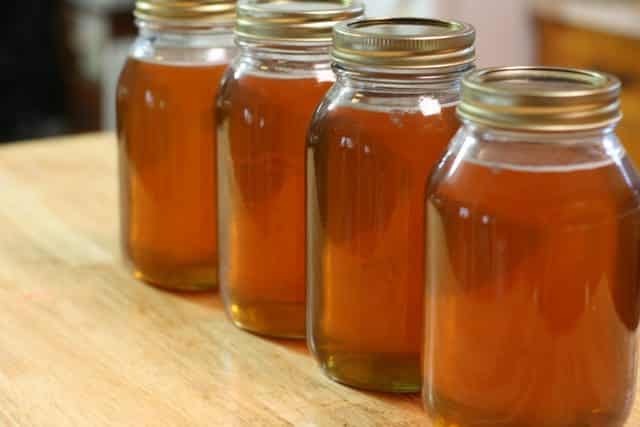 Fresh honey is wonderful in and on everything. Try it on vanilla ice cream or yogurt with a sprinkling of sunflower seeds on top. Yummy! Now I buy it at our local farmers market. 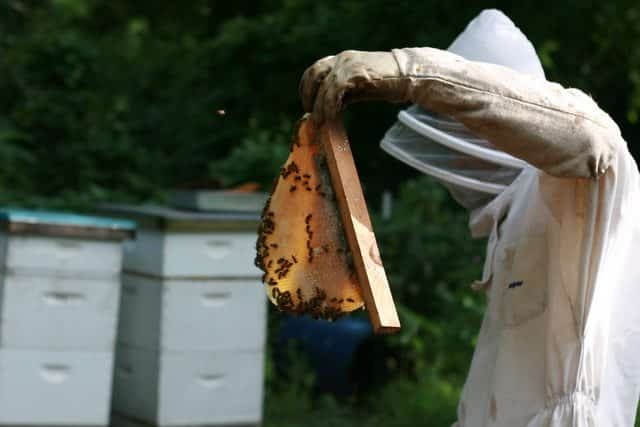 Towns around us are changing local ordinances and are allowing homes to have 2 hives in their yards. I may try it again. Take Care! I’ve been stung twice but it’s really because I don’t suit up properly when I go take pictures. That is really cool that your town is becoming more bee friendly. If you decide to keep bees again, I’d love to hear about it. Such a beautiful process and you captured it so amazingly! 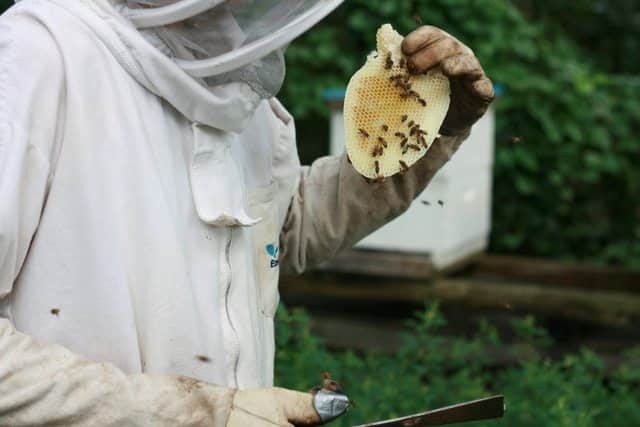 I think my husband might revolt if I mentioned I wanted to add honey bees to my hobby farm someday… the process you documented looks very fascinating! 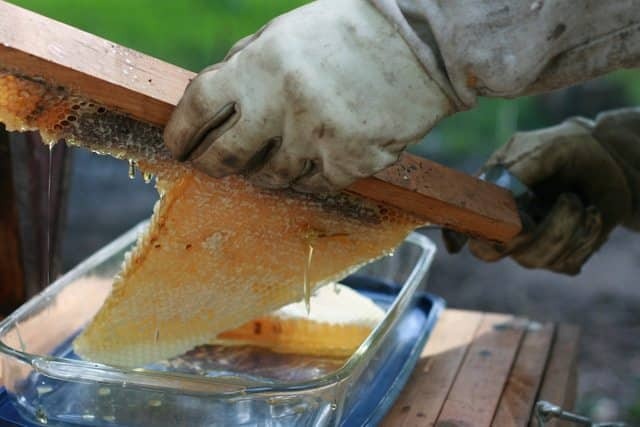 I would love fresh honey from my own bees! Oh, he’ll come around eventually…they always do ;-). They are so fascinating, aren’t they? I love how you are using the honey to barter for things you don’t have. 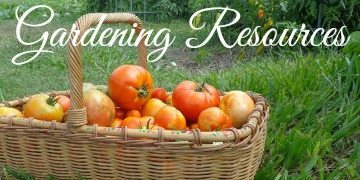 One day I hope to do that with our fruit trees. 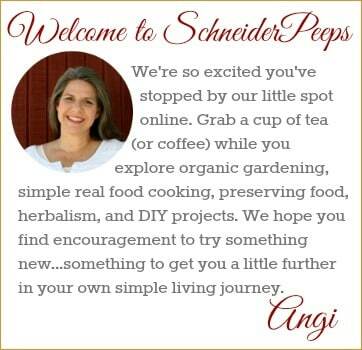 What essential oils are you using for your allergies? We are EXTREMELY new beekeepers. We just got our two beehives this year (a top bar and a langshorth hive. My question is when do you harvest from the top bar? We have additional supers for the langshorth and we’re told to harvest at the end of the season in August but the topbar can’t be expanded so I am unsure of when to harvest from it. Thank you! 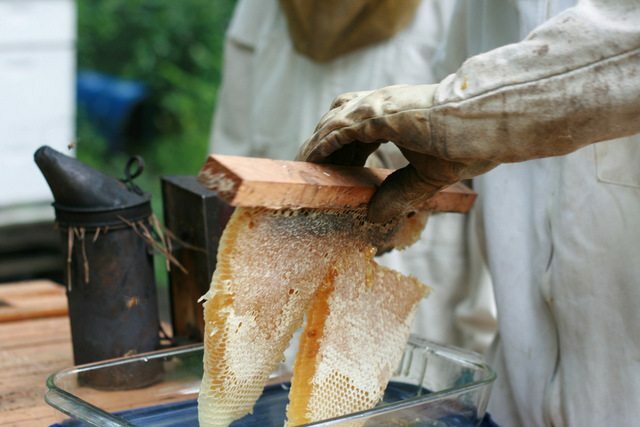 So you have both a top bar and a Langstroth hive? Do you prefer one over the other? What is the difference in the honey yield between the two? 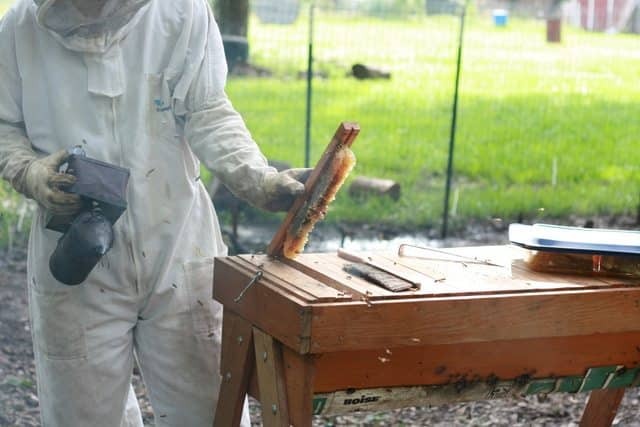 I just got two top bar hives this spring – first time beekeeping – and they are busily building comb these days. One of the two hives has honey in it now. 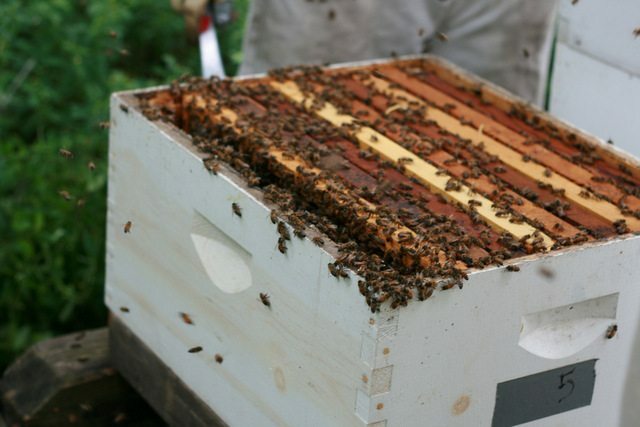 Your bees and comb look beautiful! I hope ours are like that when we get to harvest. We do have both. I’m not the beekeeper so I asked my son. 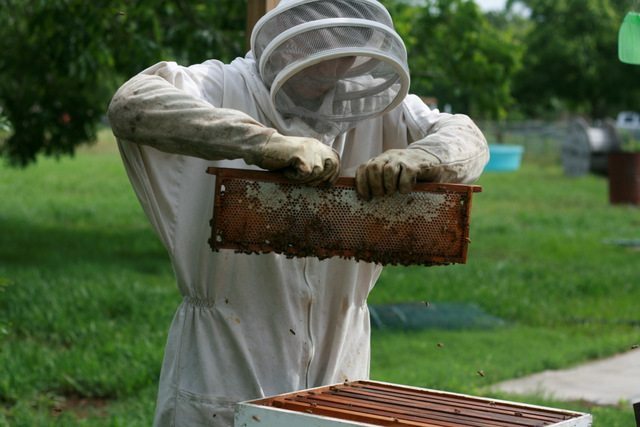 He said, “The top bar hive is great for pollination and if you are not looking to get a lot of honey. You will need to check it and harvest more often so they don’t swarm. It’s easier to get into and take the honeycomb out. But it’s harder to remove the honey from the comb. The Langsthroth hives are easier in that you can just continue to add supers to expand the hive to prevent swarming. 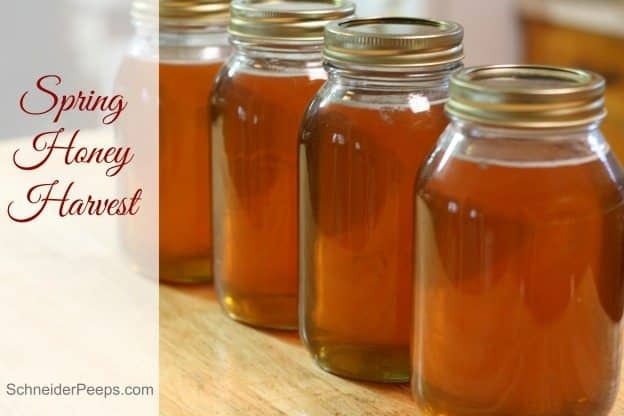 You’ll get more honey from a Langstroth hive and it’s easier to extract. 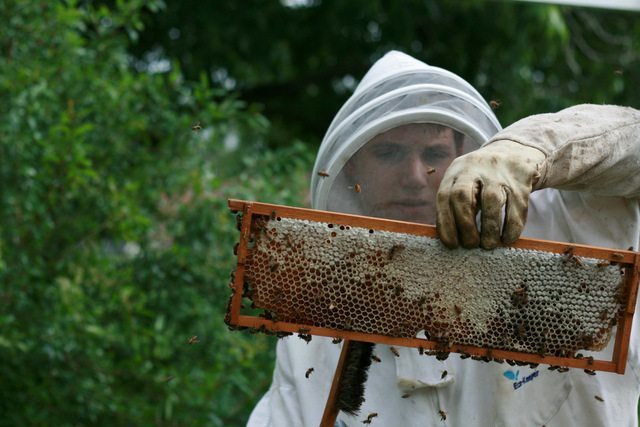 But they are harder to get into and the hives can grow much bigger.” I, personally, love the the top bar hive. Ours has an observation window and I like to go check it out. To me the only drawback is extracting the honey. 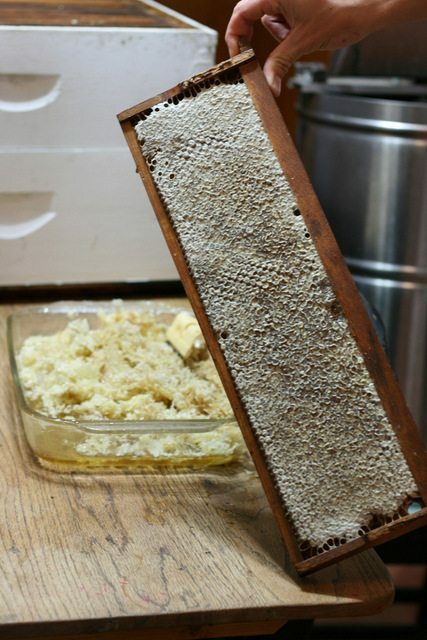 We leave the honey from the top bar hive in it’s comb. Gabriel sells most of it but we keep some of it as a treat. 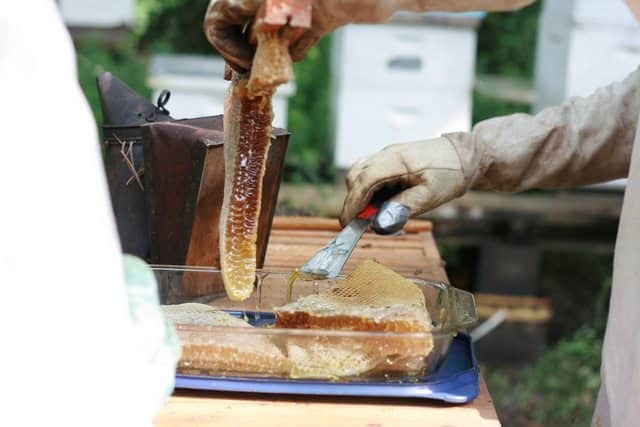 For our honey that we’re going to use to cook with or put in tea, we use the honey from the Langsthroth hives. I’m sure your bees are going to be wonderful, I’m excited for you guys! 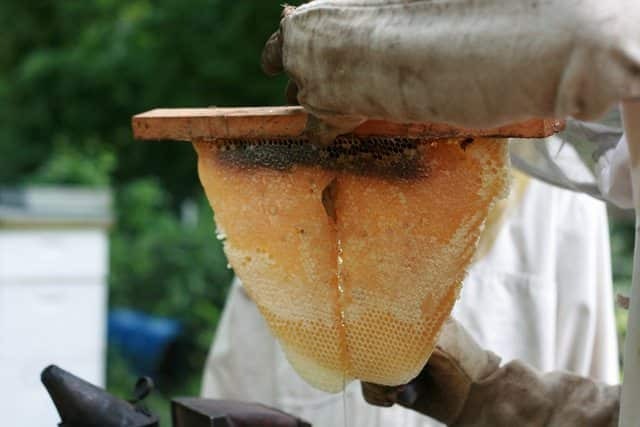 And, yeah, the comb from the top bar hive is just beautiful.